Pope Pius X, born Giuseppe Melchiorre Sarto, was the first Pope elected in the 20th century. He came to the papal office in 1903 and died 11 years later in 1914, just as World War I was beginning. He was born in 1835 at Riese, near Venice, and was one of eight children. His family was poor. He felt a calling to be a priest at a young age and was ordained in 1858. After 26 years, he was named bishop of Mantua, Italy, and in 1893, he became patriarch of Venice. As Pope, he issued decrees making the age of First Holy Communion earlier (at the age of 7) and advocated frequent and even daily reception of the Eucharist. He promoted the reading of the Bible among laypeople, reformed the liturgy, promoted clear and simple homilies, and brought back Gregorian chant. He revised the Breviary, reorganized the curia, and initiated the codification of canon law. 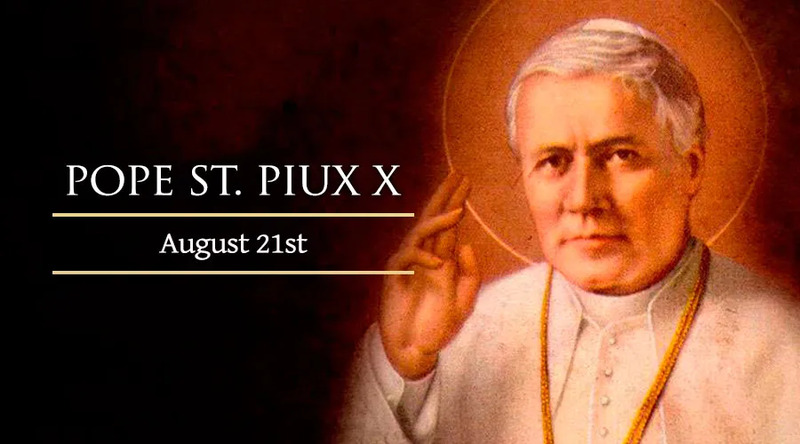 He died in 1914 of natural causes reportedly aggravated by worries over the beginning of World War I.
Pope Pius X was canonized by Pope Pius XII in 1954.